Paleontology, paleoecology, taphonomy, and phylogeny of marine vertebrates with an emphasis on marine mammals. 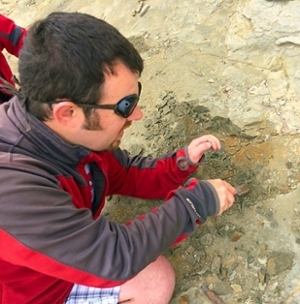 Research at College of Charleston focuses on the immensely important but critically understudied assemblage of early whales (Mysticeti) and dolphins (Odontoceti) from the Oligocene Ashley and Chandler Bridge formations of the Charleston embayment. Churchill, M., and R. W. Boessenecker. 2016. Taxonomy and biogeography of the Pleistocene New Zealand sea lion Neophoca palatina (Carnivora: Otariidae). Journal of Paleontology 90:2:357-374. Boessenecker, R. W., and R. E. Fordyce. 2015. A new genus and species of eomysticetid (Cetacea: Mysticeti) and a reinterpretation of "Mauicetus" lophocephalus Marples, 1956: transitional baleen whales from the upper Oligocene of New Zealand. Zoological Journal of the Linnean Society 175:607-660. Boessenecker, R. W., and R. E. Fordyce. 2015. Anatomy, feeding ecology, and ontogeny of a transitional baleen whale: a new genus and species of Eomysticetidae (Mammalia: Cetacea) from the Oligocene of New Zealand. PeerJ 3:e1129. Boessenecker, R. W., and M. Churchill. 2015. The oldest known fur seal. Biology Letters 11:20140835. Boessenecker, R. W. and R. E. Fordyce. 2015. A New eomysticetid (Mammalia: Cetacea) from the Late Oligocene of New Zealand and a reevaluation of “Mauicetus” waitakiensis". Papers in Palaeontology 1:107-140. Boessenecker, R. W., Geisler, J. H., and F. A. Perry. 2015. Globicephaline whales from the Mio-Pliocene Purisima Formation of central California. Acta Palaeontologica Polonica 60:113-122. Boessenecker, R. W., and A. W. Poust. 2015. Freshwater occurrence of the extinct dolphin Parapontoporia (Cetacea: Lipotidae) from the upper Pliocene nonmarine Tulare Formation of California. Palaeontology 58:489-496. Tsai, C.H., and Boessenecker, R. W. 2015. An Early Pleistocene gray whale (Cetacea: Eschrichtiidae) from the Rio Dell Formation of Northern California. Journal of Paleontology 89:103-109. Boessenecker, R. W. and R. E. Fordyce. 2014. Trace fossil evidence of predation upon bone-eating worms on a baleen whale skeleton from the Oligocene of New Zealand. Lethaia 48:326-331. Churchill, M. M., Boessenecker, R. W., and Clementz, M. 2014. Colonization of the Southern Hemisphere by fur seals and sea lions (Carnivora: Otariidae), revealed by combined evidence phylogenetic and Bayesian biogeographic analysis. Zoological Journal of the Linnean Society 172:200-225. Racicot, R. A., Deméré, T. A., Beatty, B. L., and R. W. Boessenecker. 2014. Unique feeding morphology in a new prognathous fossil porpoise from the Pliocene of California. Current Biology 24:1-6. Boessenecker, R. W., Perry, F. A., and J. G. Schmitt. 2014. Comparative taphonomy, taphofacies, and bonebeds of the Mio-Pliocene Purisima Formation, central California: strong physical control on marine vertebrate preservation in shallow marine settings. PLOS One 9:3:e91419. El Adli, J., Deméré, T. A., and R. W. Boessenecker. 2014. A new species of the diminutive baleen whale Herpetocetus (Cetacea: Mysticeti) from the upper Pliocene (Piacenzian) of California, USA with observations on the evolution and relationships of the Cetotheriidae. Zoological Journal of the Linnean Society 170:400-466. Boessenecker, R. W. 2013. A new marine vertebrate assemblage from the Late Neogene Purisima Formation in Central California, Part II: Pinnipeds and Cetaceans. Geodiversitas 35:4:815-940. Boessenecker, R. W. 2013. Pleistocene survival of an archaic dwarf baleen whale (Mysticeti: Cetotheriidae). Naturwissenschaften 100:4:365-371. Boessenecker, R. W. 2013. Taphonomic Implications of barnacle encrusted sea lion bones from the Middle Pleistocene Port Orford Formation, coastal Oregon. Journal of Paleontology: 87, No. 4, pp. 657-663. Boessenecker, R. W. and M. Churchill. 2013. A reevaluation of the morphology, paleoecology, and phylogenetic relationships of the enigmatic walrus Pelagiarctos. PLoS One 8(1) e54311. Marx, F.G., Buono, M.R., Fordyce, R. E., and R. W. Boessenecker. 2013. Juvenile morphology: a clue to the origins of the most mysterious of mysticetes? Naturwissenschaften 100:3:257-261. Boessenecker, R. W. 2011A. Herpetocetine (Cetacea:Mysticeti) dentaries from the Upper Miocene Santa Margarita Sandstone of Central California. PaleoBios 30:1:1-12. Boessenecker, R. W. 2011B. New records of the fur seal Callorhinus (Carnivora: Otariidae) from the Plio-Pleistocene Rio Dell Formation of Northern California and comments on otariid dental evolution. Journal of Vertebrate Paleontology 31(2):454-467. Boessenecker, R. W. 2011C. A new marine vertebrate assemblage from the Purisima Formation in Central California, Part 1: fossil sharks, bony fish, birds, and implications for the age of the Neogene Purisima Formation west of the San Gregorio fault. PalArch's Journal of Vertebrate Paleontology 8(4):1-30. Boessenecker, R. W. and F. A. Perry. 2011. Mammalian bite marks on juvenile fur seal bones from the late Neogene Purisima Formation of Central California. Palaios 26(2):115-120. Boessenecker, R. W. and N. A. Smith. 2011. Latest Pacific basin record of a bony-toothed bird (Aves, Pelagornithidae) from the Pliocene Purisima Formation of California, U.S.A. Journal of Vertebrate Paleontology 31(3):652-657.